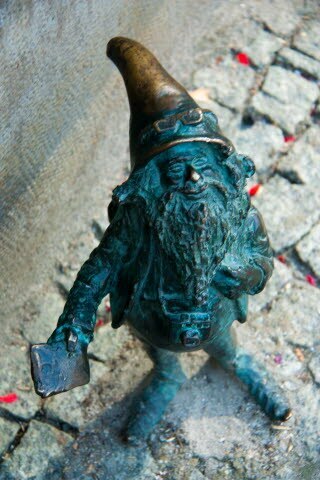 If you're out and about sightseeing in Wroclaw, you’re sure to come across little dwarfs wherever you go. They’re climbing up lamp posts, getting drunk in the streets and making riding a motorbike in the city a perilous enterprise indeed. 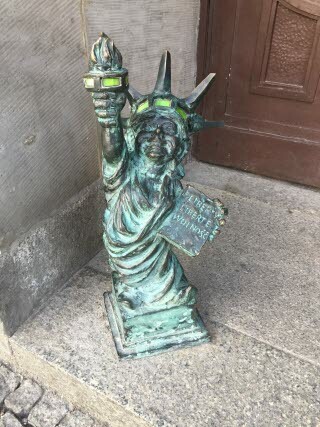 But have no fear – these hooligans are only bronze figurines intended to bring the locals and tourists luck. But what is all the fuss about the dwarfs of Wroclaw? And where exactly can you find them? The story that the dwarfs – 'Kresnale' (in local parlance) – have to tell started in 1989. Back then, a group of Polish artists calling themselves the 'Orange Alternative' drew attention to themselves worldwide with their peaceful political protests against the Communist regime. In many Polish cities, they painted dwarf graffiti on the walls of houses or demonstrated dressed up as dwarfs for a democratic Poland. In 2001, the first figurines were erected to honour the activists and have been a symbol of the fight against communism ever since, defining the image of the city of Wroclaw like no other attraction. The first of the dwarfs, which according to Polish folklore are protective spirits bringing prosperity and order, had become so popular with the residents and visitors to Wroclaw that it didn't take long for more to follow. Since 2004, more dwarfs are constantly being added by various artists with the result that you can see dwarfs almost everywhere in Wroclaw. 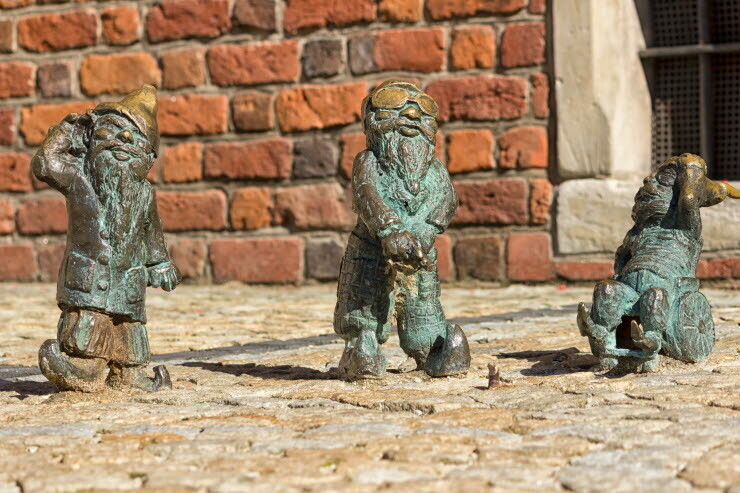 Many of the figures are not only amusing to look at, but also have interesting stories: 'W-Skers', a dwarf in a wheelchair, was for example the first physically impaired gnome in Wroclaw and is the mascot of the 'Wrocław without Barriers' campaign. The 'Weteran' near St. Elisabeth's Church, on the other hand, symbolises the courage of all soldiers and was unveiled on Polish Veteran's Day. In this way, looking for and finding dwarfs in Wroclaw is not only entertaining, but also highly informative for the whole family. The number of what must now be over 300 dwarfs is constantly changing – the little figures are so popular that the troop is sometimes reduced by the odd theft but always grows with the addition of new works of art. The enormous number of dwarfs means that the little rogues can be found everywhere, especially in the town centre where they are on practically every street corner. If you want to go on a focused search there's a special city map at the Dwarf Information Centre at the Town Hall where you can also buy a dwarf souvenir. The Krasnale also have their own website together with an interactive map that reveals all the hidden dwarfs. There are also city tours on offer especially for these little folk, and on these walking tours, the guides go into considerable detail about the individual figures. But the dwarfs are most charming when you simply come across them when strolling through Wroclaw’s streets and let them take you by surprise. The best location for your own dwarf expedition is Scandic Wroclaw, which is only a few minutes’ walk away from the famous market square and many other places of interest.